3. Please confirm the size according to our description instead of the photos. Return by problem,buyer needs to pay for the return postage. 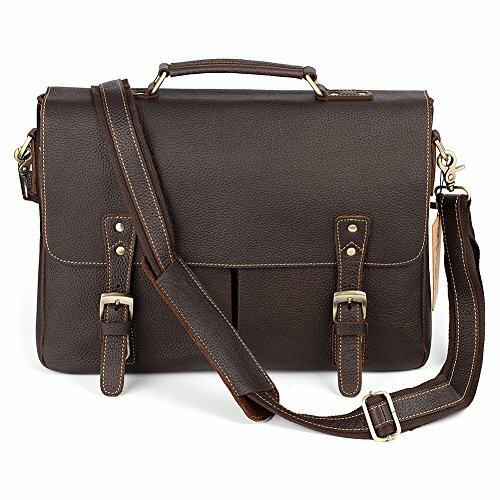 Excellent well made genuine leather Style: laptop bag, briefcase, handbag, messenger bag. Size:40x10x30cm/ 15.7x3.9x11.8 inches Internal Structure:1 laptoppocket perfect for 14-15 inch laptop,1 compartment pocket ,and some extra pockets to hold wallets, keys, pens. Please note that leather bag may have wrinkles, scars, scratches that are inherent characteristics and natural beauty of the hide.